Can you give me a Lamborghini? How can I acquire a Lamborghini? How do I register my Lamborghini? What do you require? How do I become a car designer? How did Lamborghini get started? What is the history of the company? How can I get a job at Lamborghini? How can I open a Lamborghini Dealership? What is the email address for a particular person at the Lamborghini factory? 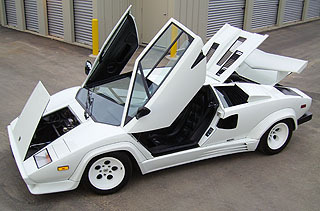 What is the open door height on a Lamborghini Countach or Diablo? Will it fit in my garage? What are your Terms and Conditions for use of this web site? Unfortunately, no, we cannot. See next question. Most of the owners we know are engineers, architects, dentists or small business owners. But get a job or career doing what you love. Start off buying a less expensive model like an Espada, Urraco or Jarama and trade up every few years through the Countach and Diablo range until you work your way into a newer model. The only very young owners that we know who have these more expensive models come from families that are wealthy and they didn't have to work for their money. Very few owners we know have had their Lamborghinis given to them. Trust me, you will appreciate and care for your cars more if you work hard and save for them and you'll be less likely to trash them as a result. Good luck. - Attach a couple of photos (interior, exterior, engine, luggage space, front 3/4 view, rear 3/4 view, etc.). Please also rename the attached photos to include the chassis number and appropriate description (eg: #8502interior.jpg). See our Company History page for the full story. This is a long process involving years of prior ownership as a car dealer and mechanical service point for exotic automobiles. It is not something that can take place over night by someone wishing to get into a new career. If you have such experience and are serious about pursuing such a venture contact the factory by mail or courier expressing such interest and outlining your qualifications. The Lamborghini factory are inundated with a flood of emails daily. For this reason we do not give out email addresses for anyone at the factory. I you absolutely must contact the factory I recommend that you do so by letter mail, courier or telephone. Countach opened door height = 80"
Countach opened engine cover height = 80"
Diablo opened door height = 76"
Diablo opened engine cover height = 80"
See our Copyright Policy page for full details. See our Terms & Conditions For Use page for full details. See our Website Disclaimer page for full details.